There’s nothing quite like a suri (pronounced SUR-ee) in full fleece, with its locks blowing in the breeze. Suris are the rarer of the two types of alpacas and comprise about 20% of the U.S. alpaca population. The Alpaca Registry (ARI) showed about 23,103 suri alpacas registered in the United States as of July 2009. These elegant animals are characterized by their draping locks. You can see how the fiber hangs down rather than looking wooly and round like on huacayas. This fiber is slick and straight with little or no crimp and has a high degree of sheen. It looks a lot like Angora goat fiber. At the microscopic level, the scales on follicle of the hair of the suri fiber are smooth edged and one directional giving it this slickness. When commercially processed, suri fiber is almost always processed using the worsted process, which results in a thin, hard thread which is used in making gabardines and crepes. Suri fiber brings a premium price on the world market because of its scarcity and unique characteristics. Because of the hang of the fiber, suris often look more delicate than their huacaya counterparts, but they are every bit as well boned and muscled. Weights and proportions are about the same for both types of alpaca. 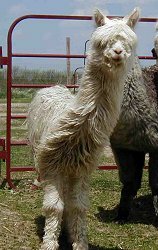 Traditionally, most suris were white, but U.S. alpaca breeders have been selectively breeding since the animals were imported to the United States to produce colored suris and now many colored suri alpacas are available.